I rarely write reviews on here but if there is one person worthy of being talked about on my blog it is Beyoncé. 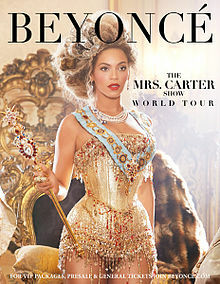 Last Friday (May 24th), I had the pleasure of seeing the wonderful Mrs. Cater in action at the O2 World in Berlin. Having seen her before I knew what to expect, but with no new material as such to perform (we did get a blast of ‘Grown Woman’), I was slightly worried it might be a little repetitive. Thankfully I was proved wrong and had an amazing night! Beyoncé had a support act that, no matter how much I had myself convinced it would be, was not Rita Ora (I also had this problem by telling myself Jay-Z would make an appearance). Instead she had Luke James. My mother always taught me that if you have nothing nice to say than say nothing at all. Heeding her advice we will move swiftly on. The theme of the concert was ‘becoming a woman’ and during each interval screens were loaded with mini-films focusin g on the natural progression of womanhood. Some were quite lighthearted and energetic while others admittedly brought a tear to my eye. That may sound extremely sad but Beyoncé has a way of making me feel empowered and like I can take on the world, or at the very least strive for the best. She played the usual favorites which never seem to get old and even added a Destiny’s Child number, ‘Survivor’, for good measure, even if she didn’t finish the whole song. I do have one complaint though – the finish. Having read the set list prior to the concert, I knew what to expect; a rendition of ‘I Will Always Love You’ followed by a mash-up of ‘Suga Mama/Green Light’. ‘‘I Will Always Love You’ we got, although again not finished much to the delight/disappointment of some people. But ‘Suga Mama/Green Light’ was just played on low in the background while Beyoncé thanked her crew. Fair enough giving them acknowledgement and all but it was a rather dull way to end the show. Yes I did still leave on a high but one last boogie would have been great. Nevertheless it was an exceptional night and I am sorry to see the night over. While the tickets may be considered pricey by some, for any fan of the singer it was worth it. I would love to hear from anyone else at the concert and if they enjoyed it. *Please note that due to my bad phone camera, none of these pictures are mine but have been credited to the source by clicking on the image.